2018 – the year of the book! Today’s post is simply an excitement post about how great 2018 is going to be for all things books! Fellow worms, it is only January and we have seen some great new books released already this year. 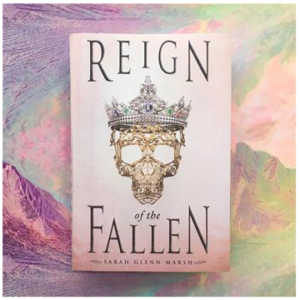 As you may know, if you follow my posts at all, one of my new faves just had its official release day yesterday – so Happy Book Birthday to Reign of the Fallen -and a big congratulations to the author, Sarah Glenn Marsh! This book is a dark and dreamy YA-fantasy that had me hooked within the first few pages. If you are looking for an exciting new fantasy series with all the bells and whistles, please do yourself a favor and pick this one up. I mean, the cover love alone -it’s gorgeous! Yesterday I also received my hard copy of The Cruel Prince by Holly Black. If you are not familiar with Holly Black’s writing, it is YA-fantasy generally involving the fae-folk and this book is no different. The official release date for The Cruel Prince was January 2nd – I have been looking forward to it for so long and can’t wait to get to it! Early reviews of it are pretty solid, many calling it lovely and magical….yeah, I could use some of that in my life, so planning to start this one as soon as I can. There are way to many more exciting new releases this year to possibly list here but the following are some of the ones I am really anticipating and that I will most likely be getting hard copies of: Children of Blood and Bone by Tomi Adeyemi, The Hazel Wood by Melissa Alpert, Untitled (Warcross #2) by Marie Lu, Catwoman: Soulstealer (DC Icons #3) by Sarah J. Maas (!!!! ), Throne of Glass #7 by Sarah J. Maas, and Obsidio (The Illuminae Files #3) by Amy Kaufman. What books are you most looking forward to seeing released this year!? I really want to hear, that way I can add any I am missing to my tbr list! As always, happy reading bookworms!